The Oakland Starting Smart and Strong Initiative believes that all children, regardless of race or family income level, deserve to start school ready to succeed. 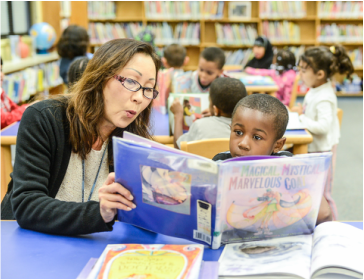 Preschool literacy skills predict both 3rd grade reading success and high school graduation rates, yet in Oakland public schools less than half of all children of color begin school kindergarten-ready. Led by the Oakland Unified School District (OUSD) and the Oakland Public Education Fund, the Oakland Starting Smart and Strong Initiative is tackling this problem head on, starting with the city’s youngest learners. The 45-member task force, part of a 10-year project supported by the David and Lucile Packard Foundation, includes funders, advocates, service providers, and district staff all working to ensure kindergarten readiness for every child. While there are many factors involved with a child developing these skills, Oakland Starting Smart and Strong will pilot a program with African American boys focused on racial and economic gaps and the effects of trauma on early childhood. Taking a research-based approach, the pilot program will support whole-child development and include mental and behavioral support for children and families, as well as professional development for teachers. The task force will track both short and long-term success, measured by indicators such as attendance at parent workshops, regular home visits by family liaisons, and training for teachers in trauma-informed practices. The lessons learned and emerging best practices from this pilot will be incorporated into the OUSD’s Early Childhood Education system. Long term, the initiative’s leaders see this pilot as a tipping point for truly understanding how a strong early childhood education can improve the lives of all children as they learn and grow. Preschool literacy skills predict both 3rd grade reading success and high school graduation rates. In Oakland public schools less than half of all children of color begin school kindergarten-ready. In Oakland, 30% of African American 3rd graders were proficient in reading, as compared to 78% of white students. ​African American boys account for 18% of preschoolers nationally, but represent 42% of preschool students suspended at least once a year.